Note: The core of this section is based on "Seeing dark matter in the Andromeda galaxy" by Vera Rubin, Physics Today, 59, no 12, p. 8-9, December 2006. The solar system is part of the Milky Way Galaxy, a disk-shaped collection of stars, one of billions of galaxies in the universe. Its radius is about 100,000 light years, and it has several small "satellite galaxies," among them the two Magellanic Clouds visible from the southern hemisphere, one of which drew attention when a supernova burst in it 1987. However, the nearest galaxy of comparable size (maybe even a bit larger) is the great galaxy M31 in the constellation of Andromeda, located about 2.25 million light years away. It too is accompanied by a number of small "satellite galaxies." The designation "M31" identifies it as No. 31 in the catalogue compiled in 1771 and 1781 by the Frenchman Charles Messier. That catalogue listed cloudy and fuzzy objects in the sky, to warn off astronomers searching for new comets (Messier himself discovered 15) from objects which looked like comets but weren't. Viewed through a telescope M31 seems dim and fuzzy, disappointing non-astronomers who see nothing resembling the familiar picture of the Andromeda galaxy, with its slightly tilted disk, bright central core and dark lanes of dust. Actually that picture is a time exposure, seen only by the camera. Galaxies vary in size and shape, but this one appears to be rather similar to ours. What holds galaxies together? Apparently it is gravity, and the disk-like shape suggests that many galaxies rotate. It should then be possible to measure the rotation of a galaxy like M31 using the Doppler effect: on the receding side of the disk, the wavelength of spectral lines would be slightly shifted towards the red, on the approaching side, towards the blue. As discussed below, comparing such shifts at various distances from the center, and invoking the laws of gravity and mechanics, can tell about the way density of matter in the galaxy varies with distance. There is also another way of estimating the distribution of matter inside galaxies, by assuming that its average density at any location is proportional to the brightness of the galaxy there. With that assumption, the rate at which brightness falls off with distance from the center can also give the distribution of mass, except in the dark lanes (see image cited above) where dust blocks out starlight. Obviously, it is of interest to compare the results of both methods. The observation of the Doppler effect in M31 is not easy, and becomes even harder in more distant galaxies. As already noted, M31 is a dim object, and observing it in detail requires long time exposures. Furthermore, to observe the Doppler effect, only a small part of the light can be used, just one "spectral line" isolated by a sensitive spectrograph, and taken from just one small part of the galaxy, whose motion we want to detect. What kind of result may be expected? Our galaxy, as long has been suspected, has at its center a massive black hole, with estimated mass of around 3.7 million suns (the number is approximate). If the galaxy was held together by the attraction of that mass, and the motion around it was circular, we would expect the rotation period T to depend on distance r according to Kepler's 3rd law"
where k is some constant, related to the mass M of the attracting center. The relation is discussed (with particular attention to Earth satellites) in section #21. If the only source of attracting gravity was a central black hole, its mass would provide M, and V2 would diminish with distance like 1/r, as it does in the solar system. Indeed, it was long suspected that the center of M31 contained a black hole, though detailed pictures suggests that here we may actually have a double center. However, galaxies contain a lot more mass than their central bodies: in the Milky Way Galaxy, the central black hole may have the mass of 3.7 million suns, but the galaxy itself contains about 100 billion stars. The light of M31 is distributed more or less symmetrically around the center, so it is reasonable to assume its mass does too (hard to imagine otherwise, given that its components rotate!). As shown by Newton for the spherical Earth, the pull of gravity on a star in the galaxy midplane then depends on all the mass closer to the axis of rotation: that mass (at least if distributed throughout a spherical volume) acts as if it were concentrated at the enter, whereas mass at greater distances has no effect. Thus the effective value of M increases with distance, and the rotation velocity V in the denser parts of the galaxy may fall off less steeply than like 1/r. However, past the densest part, V should drop off, and the drop-off rate of V2 should be close to that of 1/r. Vera Rubin, an astronomer in Washington, DC, joined in 1965 the Carnegie Institution, a research organization. The following year, together with Kent Ford, she started an effort to observe Doppler shifts due to the rotation of M31. The observations themselves were made at the Lowell Observatory and Kitt Peak Observatory, both in Arizona. Previously such observations were hampered by the low intensity of light from M31. This time especially baked photographic plates were used, providing much higher sensitivity. Even then, an operator had to keep the telescope (with its attached spectroscope) manually aligned on the selected part of M31, using for reference a nearby star, a much better defined point of light. The spectral feature used was the red Hα ("H-alpha") line of hydrogen, also isolated by filters observing the Sun, because solar flares show up very well in H-alpha light (for more detail, see here) . Between 1967 and 1969, the shift of the H-alpha line was observed at 67 positions on the galaxy. 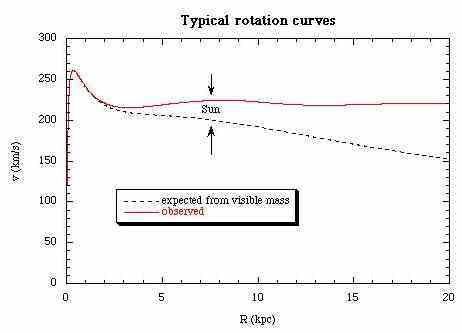 After some wiggles near the center of the galaxy (where observations also had problems), the curve of V against r was almost flat, as shown schematically on the graph above, from a web site devoted to rotation curves. What was remarkable was that the near-constancy of V extended even to the far edges of the galaxy, where very little light was emitted. If brightness was an indication of mass, then most of the mass was huddled near the galactic center, and velocities in these outer regions were expected to decrease in accordance to Kepler's law. But they did not. Radio observations (on a hydrogen microwave emission) later confirmed the flatness at even greater distances. V2 = G M/ r this seems to imply that the mass M inside a galaxy increases in proportion to distance r from the center, even in dim regions near the edge where very little starlight originates. And as for darkness, where is the place thereof? What contributes this mass? No one knows for sure. In principle you could have dark, burned out stars, but it would be a very strange universe indeed, if burned-out stars crowded the edges of galaxies, unaccompanied by brightly burning ones like those in the middle. Indeed, no convincing explanation exists. Fritz Zwicky already suggested in the late 1930s that an appreciable part of the mass of the universe was invisible, to explain the clustering of galaxies which he observed. The galaxies did not seem to have enough mass to create the gravity which held together those clusters. Many astronomers now believe that the mass of invisible "dark matter" may outweigh all other kinds in the universe, and that its attraction may be a major cause of the existence of galaxies. By that view, dark matter clumped early in the history of the universe, and ordinary matter--forming galaxies--followed it into the "gravitational traps" which it formed. The rotation of galaxies suggests that the dark matter is still present, to a large extent holding galaxies together. For more of that story, see John Gribbin's book, "Origins of the Future". It is only fair to mention here a possible loophole which could also explain rotation curves. It could be that the decrease of Newtonian gravity with distance does not follow exactly an inverse-square law, but that at very large distances, say 10,000 light years and more, gravity is slightly stronger than such a law predicts. A slight departure from the inverse-square law ("Modified Newtonian Gravity" or MOND for short) then explains the observed discrepamcies. Most astrophysicists dismiss MOND as inconsistent with general relativity, but ways out of this have recently been proposed (see "Seeing Through Dark Matter" by Stacy McGaugh, "Science" 317, p. 607-8, 3 August 2007). Unfortunately, even if MOND is accepted, there may still remain a need for dark matter to explain the clustering of galaxies first observed by Fritz Zwicky in the 1930s.